Kim Henson describes an enjoyable break in north/mid Wales. You may already have seen and read the Wheels-Alive Road Test elsewhere on our website, covering the Suzuki Swift 1.3 DDiS, which we rated as an excellent, fun to drive and creditably economical state-of-the-art supermini (for more information on the vehicle itself, please have a look at our Road Test, by clicking HERE). 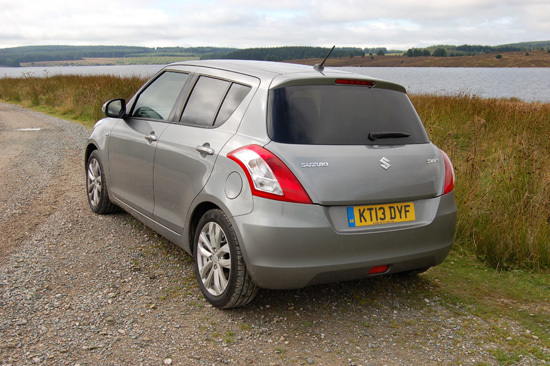 Well, in addition to putting the test car through its paces on a mixture of ‘local’ town and country roads, the Wheels-Alive team also took this Suzuki to north and mid Wales (or, more accurately, it took us…). The following is a deliberately photograph-heavy report of the week-long trip, undertaken in September 2013 (as you know, a picture is supposed to paint a thousand words…). The background to our short holiday was, quite simply, that my wife and I needed a break, having been unable to take a holiday for a few years. 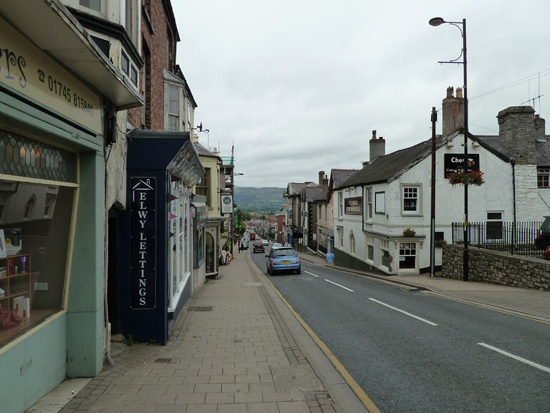 So she booked up two separate ‘bed and breakfast’ breaks (of three nights each), the first being in the heart of the old market town of Denbigh. So we set sail from our home and within a few hours the Swift (nicknamed ‘Katie’ by us, after its ‘KT’ registration; yes, I know I’m ‘sad’!) had put nearly 250 miles under its wheels. For us this involved long stretches of the M5 and M6 motorways, plus the main A55 which traverses the northernmost part of north Wales. Already the car was averaging over 65 miles per gallon, when cruising fast. 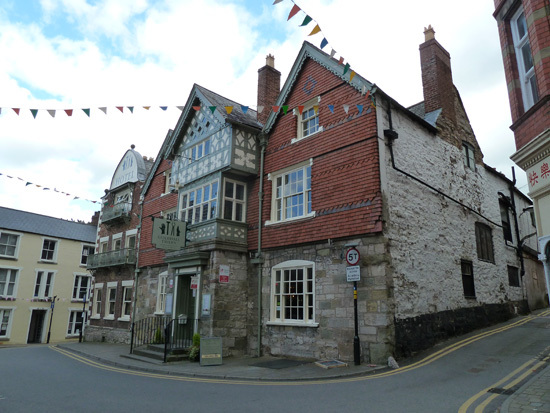 We stayed at the delightful Guildhall Tavern – a 16th Century coaching inn (formerly known as ‘The Bull’), situated in the centre of the fascinating old town of Denbigh. The location for the town is right in the heart of north Wales, within easy reach of Llangollen, the Clwydian Range and the sea. Denbigh (or, in Welsh, ‘Dinbych’ – meaning ‘small fortress’) was a border town in the 11th Century. Nowadays it is home to more listed buildings than any other town in Wales. As so often seems to be the case, due to work pressures we were running a bit later than planned when we left home, and consequently when we reached the hotel. Being the last guests to arrive for the night, we appreciated the compact nature of the Swift as it fitted perfectly into the only remaining (and tiny!) parking slot in the hotel’s car park. On the advice of hotel staff, the next morning, after a fine, reasonably-priced meal and a good night’s sleep at the Guildhall Tavern, our first port of call was the tourist information office. This – together with a museum recording the history of Denbigh – is accommodated within the 16th Century County Hall/Library building (literally just a few yards from the hotel). 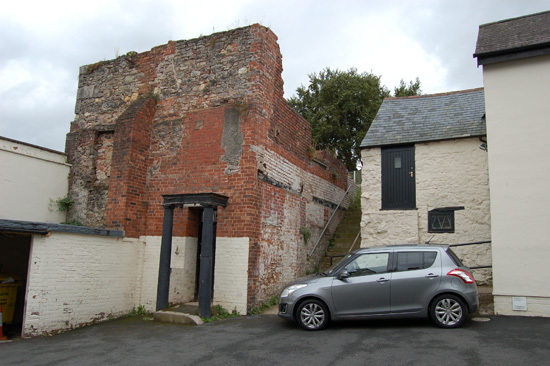 There, on payment of a returnable small deposit (£5), we were entrusted with ‘the key’ to the Town Walls, on which construction work started in the 13th Century. The views from the Walls are spectacular, in all directions, and we enjoyed exploring the ancient walls, while admiring the beautiful views from them. It’s only a short walk (fairly steeply uphill!) from the Town Walls to the Castle, which has a very interesting and chequered history; it too is well worth exploring. These days it is in the care of ‘CADW’, the Welsh government’s historic environment service. 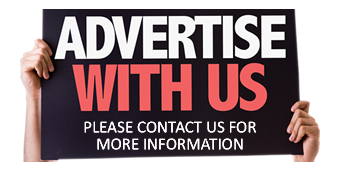 My wife and I decided to pay the subscription and join, giving free access to over 100 ‘CADW’ sites across Wales, plus reduced cost entry to English Heritage and Historic Scotland sites (half price during your first year, and free entry on renewal). While staying in Denbigh, we explored the town walls and the impressive castle (please also see our photographs and captions), and, with the aid of an information sheet obtained from the tourist information centre, we took a stroll down Vale Street, looking closely at the various buildings which are of different styles, and were built over many centuries. We found this very pleasurable – and without the information sheet we would have missed much of the detail. It was then time for a bite to eat; in the town centre there are many sandwich bars/coffee shops/pubs from which to choose. We also viewed the Welsh Radio Museum (Gwefr Heb Wifrau – ‘Wireless in Wales’), housed within the ‘Canolfan laith Clwyd’ building in the town. 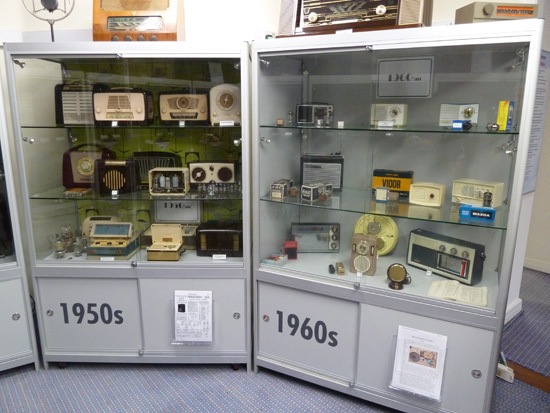 The museum, which has just been refurbished, is not huge but tells the interesting story of radio in Wales, helped by various classic receiver sets and other related items of interest. From Denbigh, the seaside resort of Llandudno is within easy reach for a day trip, or, in our case, an afternoon excursion. 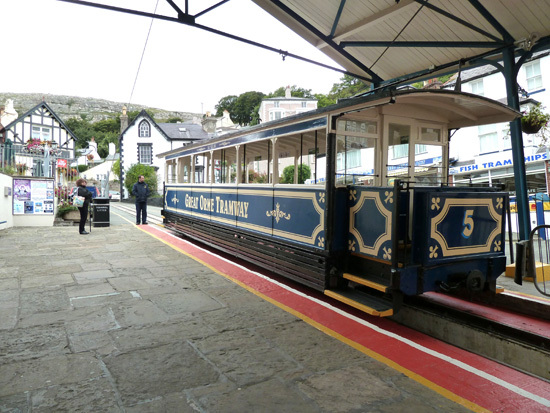 The town has many charms and attractions, and in the limited time we had available, we decided to take a ride on the traditional Great Orme Tramway. The tracks wind their way steeply through the streets of the town and up to the top of the headland. The views, on the way up (and on the descent!) and from around the visitor centre at the top, are superb, including those over Llandudno and its gently curving beach line. 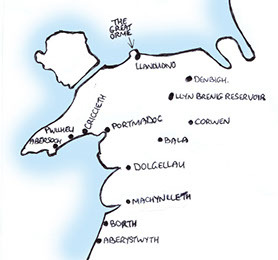 Not far to the east of Llandudno are the long-established coastal resorts of Rhyl and Prestatyn, both of which we briefly visited when returning to Denbigh. Back in Denbigh, when in one of the town’s shops, it was recommended that we pay a visit to the Cae Dai 1950s museum and country park, located about a mile outside of the town, and nestling within a verdant valley. Following the closure of the North Wales psychiatric hospital in 1994, the Cae Dai Trust was set up to provide support for vulnerable adults. The main source for this support is in the museum, itself an amazing resource and attraction for the local and wider communities. Cae Dai is able to give limited temporary accommodation to beneficiaries. 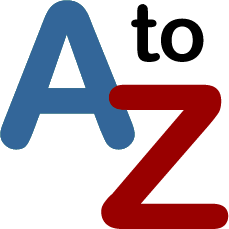 This provides an ‘umbrella’ of support, helping those staying there to gain confidence, self esteem and the life skills necessary for moving on and living independently in the community. They also enjoy looking after the animals on the adjacent farm, plus gardening in the woodland and community orchard. The Cae Dai Trust is found at Cae Dai, Denbigh, LL32 8TP. The historic Guildhall Tavern, in Denbigh town centre, provided us with a friendly welcome and excellent, affordable food. 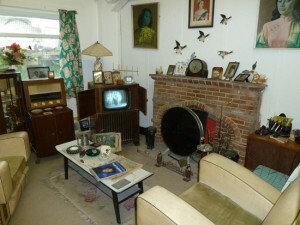 It is next to the town’s tourist information office, and is perfectly positioned for exploring the town on foot. 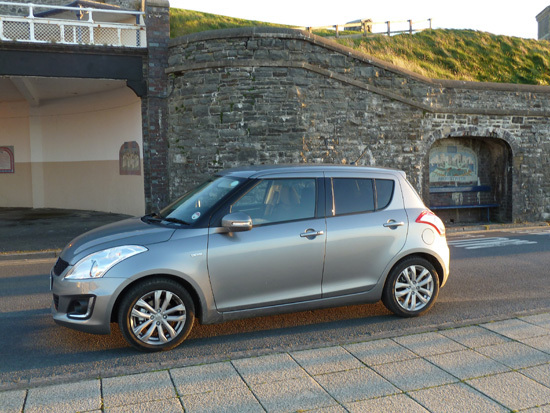 If you arrive late at Denbigh’s Guildhall Tavern, ideally ensure you are in a Suzuki Swift or a similar sized car, to be able to squeeze into the last/smallest parking space. The ‘Old Fire Station’ façade on the left of this shot is ‘Listed’. 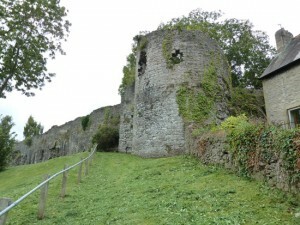 Denbigh’s Town Walls are free of charge to explore. A small returnable deposit is required, in order for visitors to borrow the key to the Walls. There is no requirement for visitors to be accompanied when touring the Walls (how trusting!). 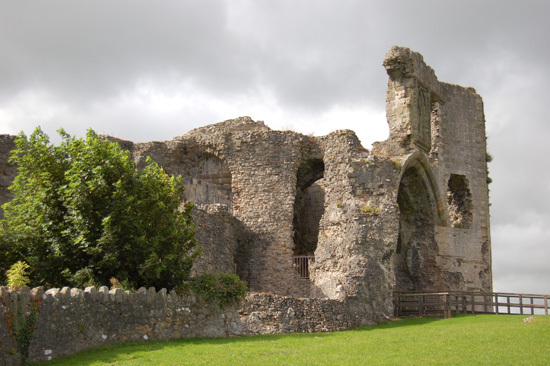 The amazing Castle at Denbigh was built after the conquest of Wales by Edward I, in the 13th Century. During the Civil War, it was the scene of a six month long siege which resulted in surrender to the Parliamentarians. While staying in Denbigh, we spent an enjoyable morning exploring Vale Street (Stryd-y-Dyffryn) with the aid of an information sheet available from the tourist information office in the town. This tells the stories of the various buildings. The compact, recently refurbished Welsh Radio Museum (Gwefr Heb Wifrau – ‘Wireless in Wales’), housed within the ‘Canolfan laith Clwyd’ building in Denbigh, is an absorbing place to visit. 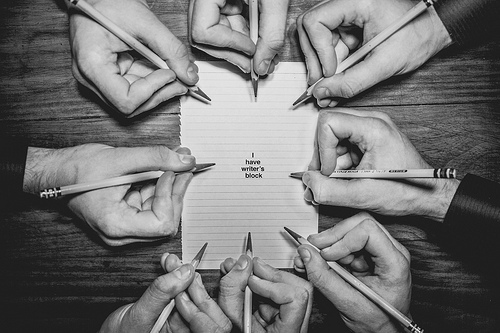 It depicts the history of radio in Wales. Our trusty Suzuki test car is seen here at rest, with a background of the sea at Llandudno. It proved to be an ideal vehicle for the narrow roads of north and mid Wales, yet was also equally at home cruising at motorway speeds, when required. When visiting Llandudno, it’s worth riding on the Great Orme Tramway. 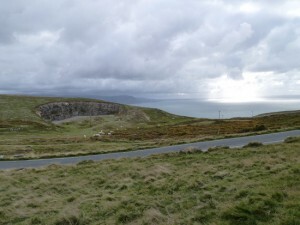 The tracks wend their way through steep, narrow streets, on their way to the top of the rocky limestone headland known as the Great Orme, towering above the town. From the top of the Great Orme there are enchanting views across the sea, as well as inland. On the day we visited, constantly changing cloud formations and varying levels of sunlight made for some great natural effects. 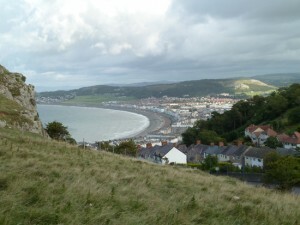 As the tramcars make their way up and down the tracks, respectively to and from the Great Orme, views like this across the town of Llandudno and its beach, can be seen. Even when the weather’s ‘changeable’, the scenery’s beguiling. When driving eastwards from Llandudno along the ‘top’ of north Wales, it’s worth taking the coast road towards Colwyn Bay, to savour views of the Irish Sea, and, if you halt awhile and take a stroll, the bracing fresh air it provides! This amazing, re-created living room of the 1950s is part of the Cae Dai 1950s museum and country park, just outside the town of Denbigh (please also see text). It is gradually being resurrected following a devastating fire a few years ago. The Cae Dai 1950s museum incorporates a contemporary service station display, in which can be found this now rare Hillman Husky plus a number of other vehicles being ‘worked on’, and many motoring-related tools, parts, etc. 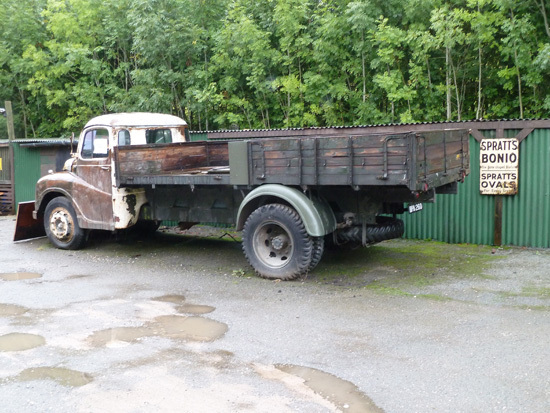 Half a century after the Great Train Robbery, the Austin lorry actually used during this infamous event still exists, and can be seen at the Cae Dai 1950s museum. 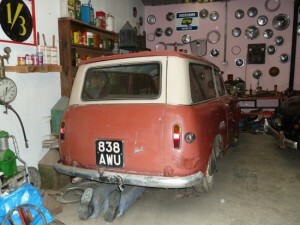 All sorts of other interesting classic vehicles reside there too. All too soon, and with some regret, it was time to leave Denbigh, but our sadness on leaving this friendly, attractive town was tempered by the prospect of seeing pastures new in and around Dolgellau, where we were headed next. 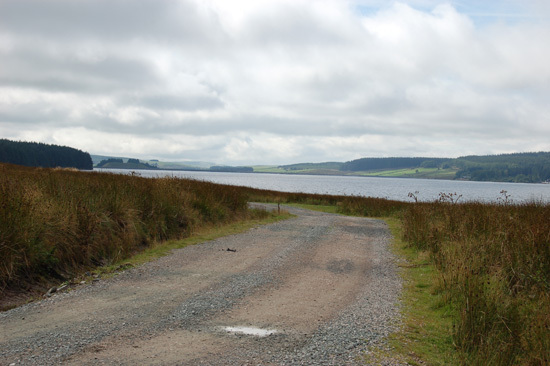 En route, we chose to take the undulating road that passes by Llyn Brenig reservoir – the fourth largest lake in Wales, with a perimeter distance of about 14 miles. It is used to help regulate the flow of the River Dee, helping to preserve the water supply for north-east Wales and the north-west of England. In addition to being an important centre of archaeological interest, this lake is also a haven for wildlife and a centre for fishing, sailing and canoeing. After stopping awhile and exploring the lakeside, we obtained a tasty lunch from the café in the visitor centre (on the main road). We took our time and enjoyed the scenic drive to Dolgellau, via Llangollen and Bala, although by the time we arrived for our overnight stop, mist and rain were obscuring the lovely views all around. 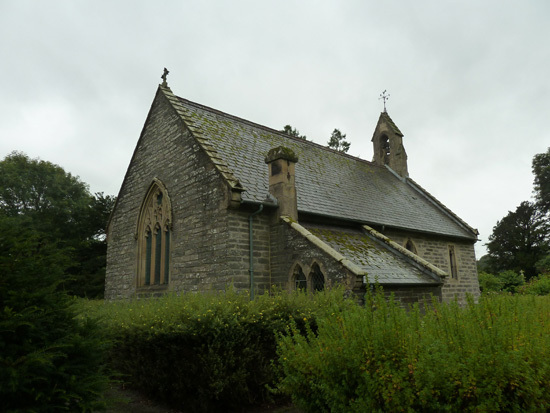 On the way, we called at the Rug Chapel (another CADW site) at Corwen (about 10 miles to the west of Llangollen). From the outside this incredible survivor of the seventeenth Century looks like a typical church of its time, but step inside and you find yourself in a different world, virtually unchanged for the last 400 years or so. 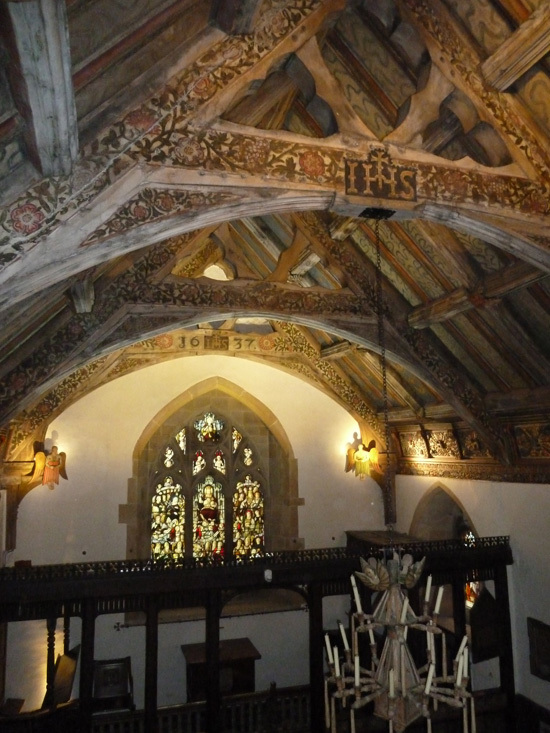 The richly carved woodwork, decorated walls and stained glass windows have to be seen to be truly appreciated. The story of the Chapel through the ages is fascinating, and displays within the chapel and its visitor centre help to tell it. We drove on, to stay at the Fronoleu Country House Hotel, just outside Dolgellau and in a secluded, peaceful hillside location. Now I enjoy my food, but I have to say that never before, anywhere, have I seen portions so immense as those we encountered at this establishment. Indeed, sadly I had to admit defeat as I could not do justice to the meal. I wasn’t the only one, among the guests residing at the same time as us! 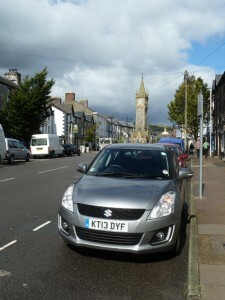 While staying near Dolgellau, we visited the town each morning. There are many small, independent shops (which even I enjoyed, and usually I am not fond of shopping!!! ), and on each day we enjoyed morning coffee at the busy, but friendly, Royal Ship Hotel (a 19th Century Coaching Inn), located in the heart of the market place (Queens Square) in the centre of town. The free WiFi access there was useful for the necessary evil of me, and my wife, catching up work-wise, and the coffee was good! From Dolgellau it is an easy and enjoyable drive northwards and towards/along the coast; it’s just a pity that it rained for most of our day in this area. We drove via Porthmadoc, Pwllheli, Criccieth (where we lunched in a snack bar and walked around the town) and on up to Abersoch. Further exploration here was discouraged by some very heavy rain which kept us within the snug Suzuki to admire the views, rather than walking along the beaches in this lovely area. 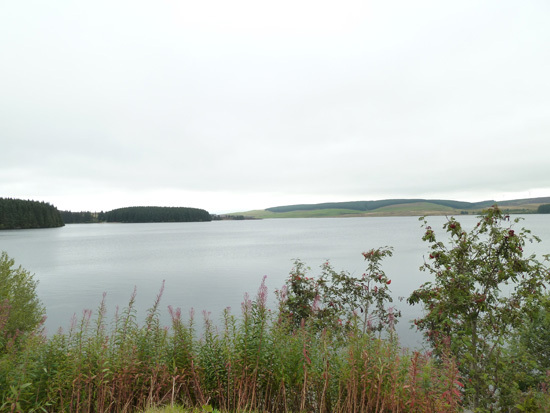 We headed south-westwards from Denbigh towards Dolgellau, on the way stopping for a while to take in the tranquility, beauty and wildlife of the Llyn Brenig reservoir, on the border between the counties of Denbighshire and Conwy. A winding, unmade track uncoils from the main road around much of the Llyn Brenig reservoir, which took three years to construct, beginning in 1973. 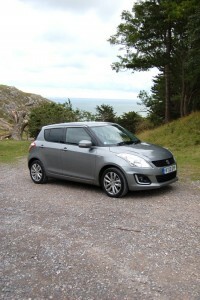 Here ‘our’ Swift is seen taking a break from the undulating main road south. At the Llyn Brenig reservoir, we paused and listened; all we could hear was the quiet lapping of the water on the nearby shore, the rustling of the foliage as it moved in a gentle breeze, and the far-off sounds of contented sheep! Bliss!! Inside the Rug Chapel, the amazing intricacy of its decoration becomes clear. The carved woodwork (dated 1637!) and beautifully painted walls, together with delicately coloured stained glass windows, are all amazing. 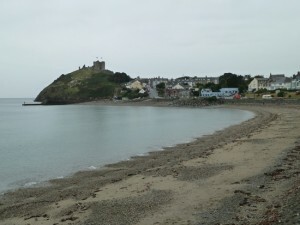 On the day we visited Criccieth, it poured, and it poured. 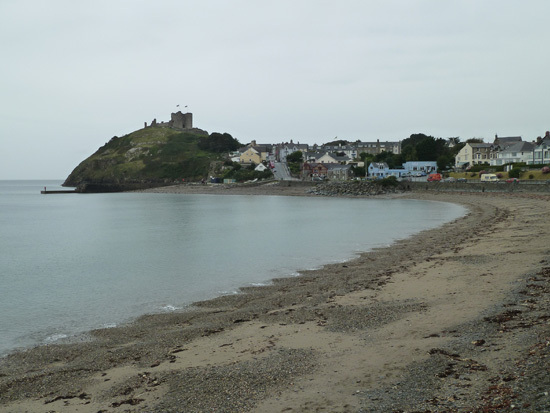 All the same, we managed a walk through the town to the beach, with its timeless view of Criccieth Castle – the remains of which incorporate both English and Welsh elements. 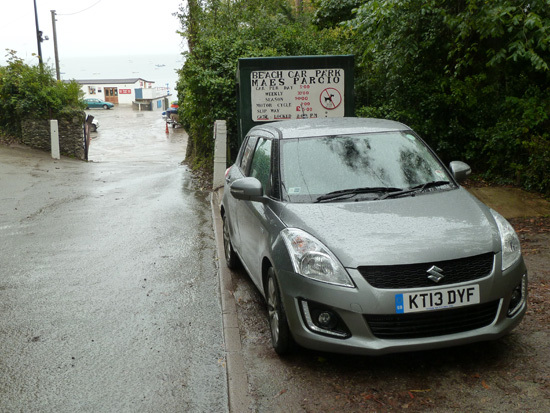 Abersoch is a pretty seaside village, but with the rain continuing to lash down, there were few takers for the beach car park on the soggy day we visited. (We did spot one man and his dog on the beach though… not shown here!). Driving south in the late evening along the coast road between Portmadoc (Porthmadog) and Barmouth, the rain stopped, the skies cleared and the sunset was beautiful. Even the sheep were impressed. 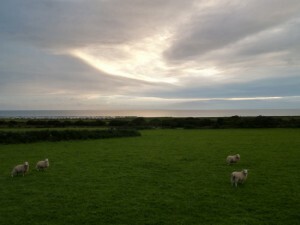 (This shot was taken near Barmouth). 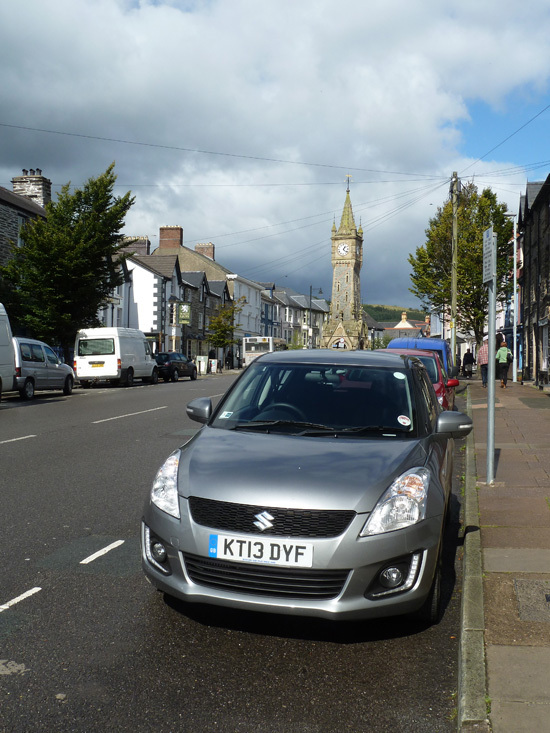 On our last full day in Wales we decided to drive from Dolgellau to Aberystwyth, via the fascinating and friendly town of Machynlleth, where we parked in the centre and explored on foot. 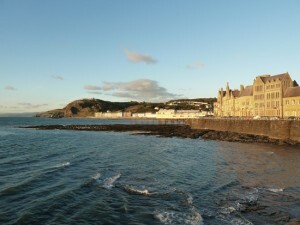 By the time we arrived at Aberystwyth, the shadows were already beginning to lengthen on the sea front. Here we left the Swift to rest, while we took to the coast path heading northwards and steeply uphill from the esplanade. Glorious! 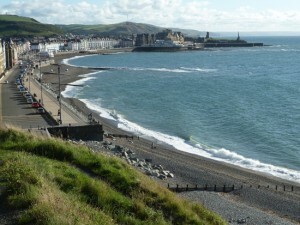 As we started to climb up the cliff path, we turned to look back along the Aberystwyth sea front. We just stood for a while, taking in the view as this was such a lovely sight to behold. 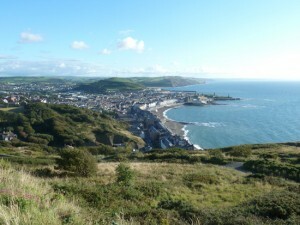 As we climbed higher, we could see even further southwards over the town of Aberystwyth, and into the hilly countryside beyond. The views to the north, and even inland, were also awe-inspiring, and the air felt beautifully fresh. As we reached the southern end of the esplanade, the buildings along the sea front at Aberystwyth were changing colour and gaining a golden hue, as the sun moved lower in the western sky. The sea birds mewed to us from the rocks below. 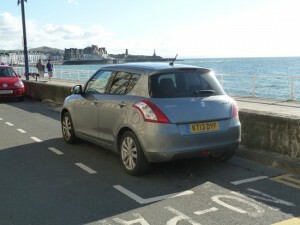 The last stop for ‘our’ Suzuki in Aberystwyth was next to the town’s castle. Just behind the car, within a cut-out in the wall on the opposite side of the road, we looked at a diorama of the castle as it would have been in 1740. 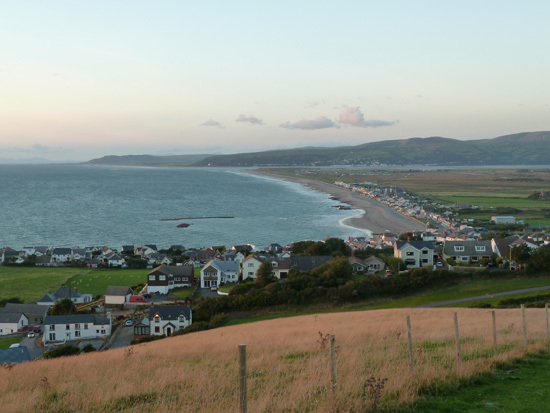 The light was fading as we neared Borth, but there was enough of it to capture the Swift as we were about to make the steep descent into the town, along the coast road, as we drove back to Dolgellau for the last night of our ‘adventure’. Just a few minutes after the previous photograph was taken, it was darker still, but the near-calm sea, Borth’s long beach and the tranquil hills to the north and beyond looked as inviting as they had in the bright sunshine earlier in the day. The next morning, the sun shone as we headed in a generally southern direction, with the aim of reaching Aberystwyth at some point in the day. Our timetable (such as it was; we were under no time constraints so we simply meandered!) was put back somewhat by a stop in Machynlleth (the town which was home to Owain Glyndŵr’s Welsh Parliament in the 15th Century). We chose to have a sandwich in the mediaeval Royal House in the town centre. While enjoying our snack we discovered by chance that the Royal House is believed to be the oldest building in Wales still in use, and we were shown ancient artefacts many centuries old, that were found in the walls of the building. All very intriguing. Eventually we moved on and headed for Aberystwyth, an attractive and historical town on the west coast of wales, and a place I never tire of. The weather was beautiful as we parked on the sea front, and we decided to walk up and along the cliff path to the north of the curving beach and bay. We were not alone, for as we climbed the steep track, we found ourselves in the company of many ‘first year’ students and their parents, who were also ‘exploring’. Why? Well, the day we had chosen for our visit had coincided with the first day of the new term for Aberystwyth University – a popular choice for many youngsters, all wishing to spend their undergraduate years in this beautiful area. As we had arrived later than we had envisaged, the Cliff Railway had already closed for the day, so we climbed the cliff path on foot. The higher we climbed, the more spectacular the views southwards across Aberystwyth and its bay, coloured by a deep blue sea, became. From the summit, we were able to admire the coastal views which stretched for many miles both to the north and south, as well as inland. We made our descent from the clifftop as the early evening wore on and sun’s rays started to colour the seafront buildings a beautiful shade of gold. 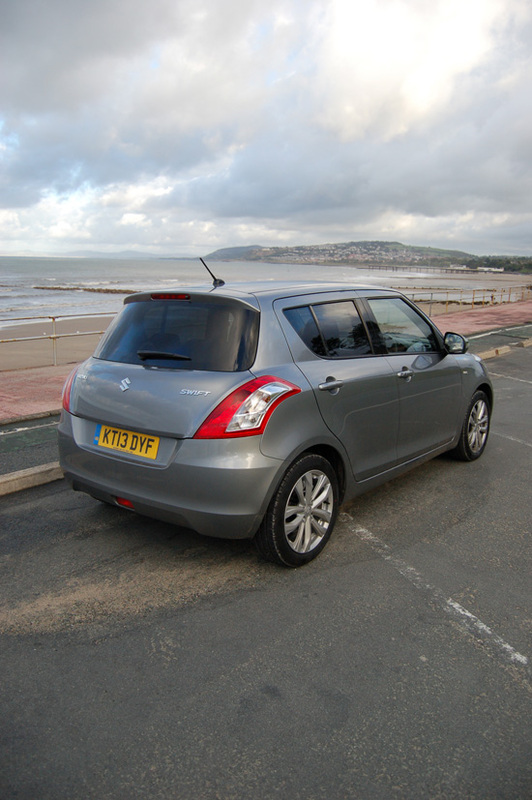 After driving to the southern edge of the bay (and the town), and stopping for a while to admire the views, also to take in the crystal clear quality of the evening light, at length we turned the Suzuki northwards again. We decided to take the coast road north, via Borth, for the first part of our journey back from Aberystwyth to Dolgellau. This provided further spectacular sights, as the sun started to set on the last evening of our holiday. 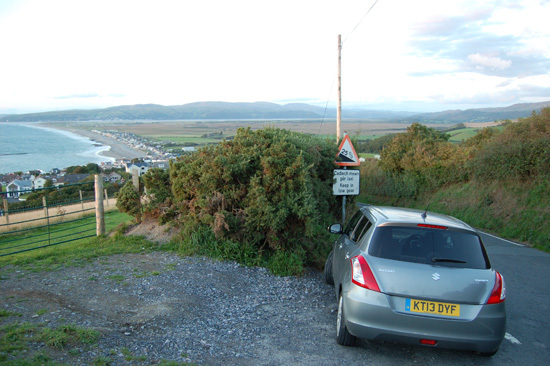 Particularly memorable was the view looking north across Borth and the sea, to the mountains beyond. I shall never forget it. It was dark by the time we returned to the Royal Ship for our final evening meal in Wales, and we discovered that many local people were eating there too. By the way, for those interested in beer, the hotel sells a variety of special varieties, including a VERY strong brew that’s best tackled in half pint measures, and definitely not at all if driving (or, possibly even walking…). For our journey home, the wind and rain had returned, but we still enjoyed traversing the hilly roads and wild countryside along our way, via Rhayader, Built Wells and Abergavenny, before joining the M4 for our return to England and our everyday ‘reality’. A WONDERFUL TIME? OH YES. Although we were only able to get away from work commitments for a total of six nights in Wales, we had a superb time there, and have pledged to return for a longer stay, when we can, to explore further. If ever you get the chance to visit the areas we sampled, please just take it; I’m sure you won’t be disappointed! 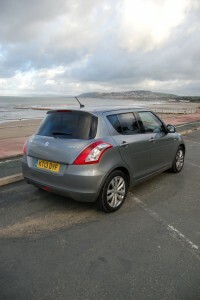 Of course, you could undertake a Welsh excursion like ours, in any car. 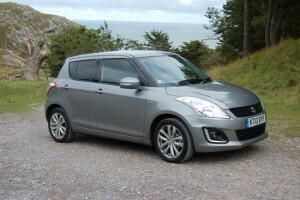 In our case, the diesel-powered Suzuki Swift (that we were fortunate to have the use of) proved to be an excellent companion for our travels, and during our holiday to/in Wales, covering approximately 800 miles in total, it achieved better than 66 miles per gallon, so fuel costs for the trip were as inexpensive as they could be, bearing in mind current pump prices.